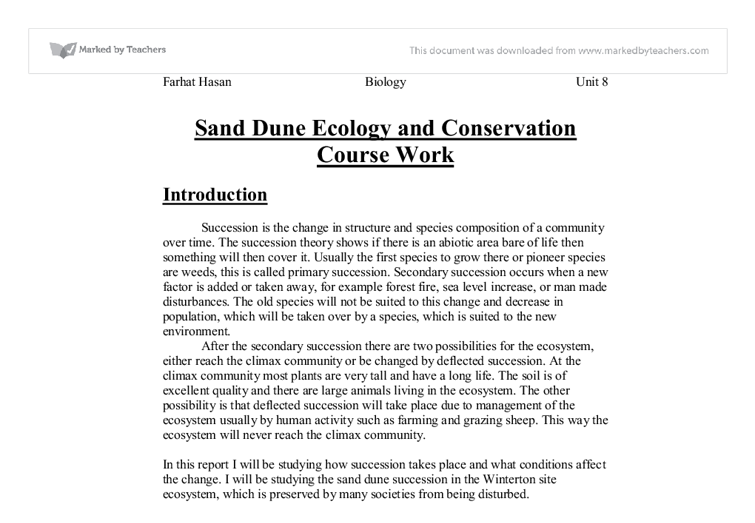 Sand Dune Ecology and Conservation Course Work Introduction Succession is the change in structure and species composition of a community over time. The succession theory shows if there is an abiotic area bare of life then something will then cover it. Usually the first species to grow there or pioneer species are weeds, this is called primary succession. Secondary succession occurs when a new factor is added or taken away, for example forest fire, sea level increase, or man made disturbances. The old species will not be suited to this change and decrease in population, which will be taken over by a species, which is suited to the new environment. After the secondary succession there are two possibilities for the ecosystem, either reach the climax community or be changed by deflected succession. At the climax community most plants are very tall and have a long life. The soil is of excellent quality and there are large animals living in the ecosystem. The other possibility is that deflected succession will take place due to management of the ecosystem usually by human activity such as farming and grazing sheep. This way the ecosystem will never reach the climax community. In this report I will be studying how succession takes place and what conditions affect the change. I will be studying the sand dune succession in the Winterton site ecosystem, which is preserved by many societies from being disturbed. 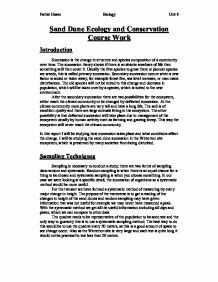 Sampling Techniques Sampling is necessary to conduct a study; there are two forms of sampling data random and systematic. Random sampling is when there is an equal chance for a thing to be chosen and systematic sampling is when you choose something. In our case we were looking at a specific detail, the succession of organisms so a systematic method would be more useful. For the transect we have formed a systematic method of measuring by every major change in height. ...read more. Ants Sand Lizard Kestrel Hyme Grass Rabbit Fox Fox Oak Squirrel Barn Owl Blue bell Butterfly Spider Ringed Plover Sheeps Fescue Sheep Humans Sea Knotgrass Shore Wainscot Moth Larvae Long winged cone head Lichen Rabbit Adder Prickly Saltwort Termites Common Lizard Meadow Pipit This is a list of some plants that were identified in the investigation: * Marram Grass * Sand couch * Sea holly * Sea Spurge * Sea Bindweed * Sea Rocket * Sea sandwort * Yellow hornet * Sea Knotgrass * Prickly Saltwort * Sheeps Fescue * Lyme grass * Lichen * Common Centaury * Heather Transfer of Energy Food Web Feeding Relationships Quantitative data on feeding relationships only shows the population of a species at each tropic level. As we move up each level on the pyramid of numbers we usually see the number decreasing as one level feeds on the other. But as you can see hear the number does not decrease as one sheep can provide for many humans. For a more accurate way of sorting data we use the qualitative method. Dry Weight (g/m ) 11 37 809 This pyramid of biomass shows us the weight of each level when all the water has been evaporated. But the problem with this pyramid is that biomass is not constant and at certain times differs due to growth or other reasons. For example animals just awoken from hibernation may only be half the weight of when they are about to go into hibernation. The pyramid of energy is shows us the amount of energy being transferred up each level. This will never be inverted as energy is always being lost as it travels up each tropic level. Justification and limitation of Sampling Techniques Transverse This is a very proficient method as the data is unbiased sampled across many different habitats. This gives a much higher probability of seeing the natural succession that occurs by studying all significant changes in gradient amongst the dune formation. ...read more. The foxes had to live on mainly leftovers from the street rubbish bins as scavengers. This meant they were not being nourished enough so when their pups were born they did not get enough food and over time this has meant a decrease in their actual physical size. Also their role in the ecosystem has changed from hunters to scavengers and this lack of exercise and no need for strength has left them weaker and with much less muscle size as their forest counterparts. Furthermore a lifetime living with street lamps has dulled their sight, so if they were put into the forest again they would definitely not be able see as well. Evaluation of the Techniques The techniques used were overall not reliable as the site of Winterton is so vast and we only covered a tiny fraction of it. Therefore other parts of the Winterton site could have been completely different in terms of plant species but this unlikely. The sand dune profile is reliable as we could see the same sort of charts being produced by many other groups. The techniques were definitely not precise as most of the equipment were not of the highest standard. The wind measuring instrument was very poor and almost impossible to get a proper reading as the little ball which indicates wind speed is constantly moving. We should have used an annometer, which gives a digital reading. As with all the other equipment, they should have been digital and read into more exact figures not just one decimal place as some did. Our results were not very accurate as the transverse method only looked at significant changes but as we were not experts we may have missed or missed placed some of these changes in altitude. With quadrat and the tests also twenty meters may not have been the right length as on the ground level we could see changes happening at maybe every five meters. But the fact that we were not experts and we had a limited amount of time needs also to be put into perspective. Farhat Hasan Biology Unit 8 ...read more. Cosmetics have no benefit to our health, and if anything can damage our skin in the long run. Although testing cosmetics on animals had been banned in the UK since 1998, other countries continue this approach to making humans 'more safer'. The men were injected with the new drug. They began to swell up and were hospitalised as they became seriously ill with fevers, vomiting, kidney, heart and liver failure, pneumonia and blood poisoning. What mystified the doctors was that the men's white blood cells had disappeared when tests on animals had the opposite effect even though the animals had been given 500 times the dosage. Flat periwinkles are found on the middle shore because they rely on the humidity under Fucus, on which they also feed. They breathe using gills so they can only respire out of water for a short period of time. Therefore, by situating on the middle shore, ensures that they are not exposed for too long during the day. Species diversity on the Ynyslas sand dunes. * Repeat 3 times * Set the compass along the transect * Measure 30 meters * Repeat the above process, using the set compass to keep transect straight. This is the method used for the trail phase, for the main period of data collection 50m sampling intervals were used due to time limitations. * Computer models are other types of methods of testing are still not advanced enough so animal testing must continue. * Animal testing is cruel because animals have to go through a lot of stress and which can lead into their death. This filamentous form can assume the form of pseudohyphae in which cells are elongated but still ellipsoidal, or true hyphae where highly elongated cells forming the filament are cylindrical and separated by perpendicular septal walls (Braun and Johnson 1997). The morphological change is thought to contribute to colonization and dissemination within host tissues and promote infection.